WELCOME TO OUR TEAM FUNDRAISING WEBPAGE! Many of you may know that my five year old daughter, Anabel, has been living with seizures since she was two years old. 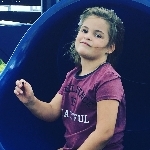 She has had four observed seizures since first being diagnosed, the most recent of which was September 4th, 2018. She also has a secondary diagnosis of electrographic status epilepticus of sleep (ESES) which can result in developmental impairment. We are raising funds to make a difference in the lives of people living with epilepsy. The mission of the Epilepsy Foundation is to lead the fight to overcome the challenges of living with epilepsy and to accelerate therapies to stop seizures, find cures, and save lives. Please support this cause by making a safe and secure donation to our fundraising webpage. Giving to the Epilepsy Foundation means you make the world a better, easier, more manageable place for the 3.5 million people in the U.S. who are living with epilepsy and seizures.